That Musk was the man who bought the legitimate barn-find Lotus Esprit from The Spy Who Loved Me is a bit of a surprise given that he isn't known to be a huge collector of film cars. "It was amazing as a little kid in South Africa to watch James Bond in 'The Spy Who Loved Me' drive his Lotus Esprit off a pier, press a button and have it transform into a submarine underwater. I was disappointed to learn that it can't actually transform. 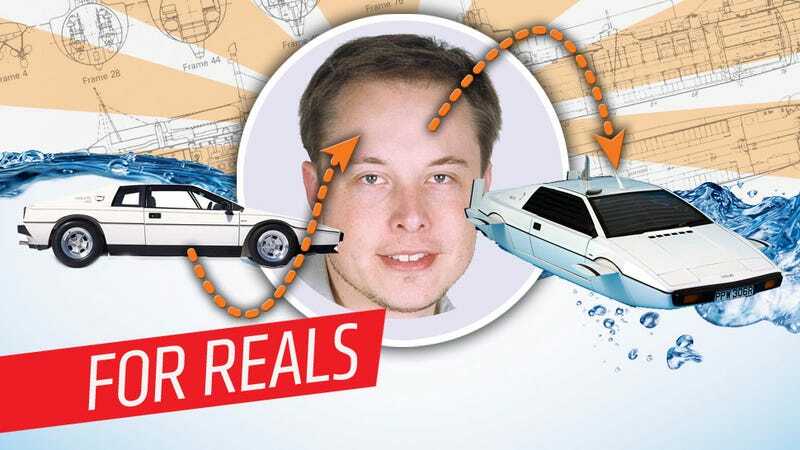 What I'm going to do is upgrade it with a Tesla electric powertrain and try to make it transform for real." It's going to be an electric submersible Bond car. I'd worry that he's toying with the half-joking theory that he's a Hank Scorpio-esque villain genius except for the fact that all of his ideas seem wild until they end up working. Seriously. Best project car ever.